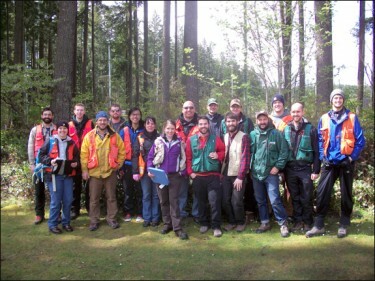 The undergraduate and graduate programs within the College of the Environment represent the rich diversity of academic and career pathways related to the environment. Student participants and their advisors who helped craft the Black Diamond Natural Area stewardship Plan. The College offers eight unique undergraduate degree programs, as well as several interdisciplinary minors. The College also offers 18 graduate degrees and two graduate certificates. Our students enjoy small programs and classes, experiential learning opportunities with strong ties to an internationally renowned research program and programs that bring traditional disciplines together at the nexus of environmental problem solving. Undergraduates in the College can study oceanography aboard one of our research vessels, learn about space physics by building rockets, join a Sustainability Studio to help green up the UW campus or explore wildlife and landscape ecology up close and personal in immersive field courses at Pack Forest or Union Bay Natural Area. Graduate students enjoy close mentorship with our world-renowned faculty and spend time doing research on all continents and in all oceans across the globe. Check out our undergraduate and graduate degrees.